When foundations settle, cracks in foundation walls can result. Most foundation walls in Alabama are constructed of concrete masonry or solid concrete. Some walls are not reinforced and others are sometimes lightly reinforced. Seldom do walls contain horizontal reinforcement in the form of rebar in concrete or joint steel in masonry. All concrete materials shrink in volume soon after construction due to loss of water upon drying/curing. As the concrete materials shrink, there is a corresponding dimension change that takes place. The foundation wall is typically bonded to the buried concrete footing so the shrinkage is well restrained along the bottom. At the top, the fairly light wood frame superstructure doesn’t provide much restraint. As such, vertical cracks will often form near the centers of long walls which are widest at the top and which narrow to hairline size at the base. 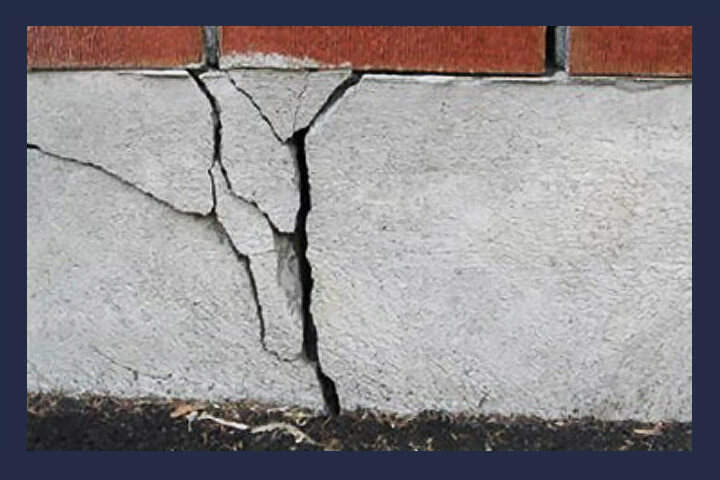 These are called shrinkage cracks and they are usually structurally unimportant. (Note: another form of vertical cracking is caused by sweeping, inward bowing of basement walls which can be a problem/concern). Stair-step cracks in masonry walls and diagonal cracks in concrete walls are often caused by differential foundation settlement. The topography of some of our area consists of moderate to steeply sloping, wooded hillsides which generally have a shallow bedrock depth– this is especially true in areas where numerous boulders or bedrock pinnacles outcrop at the ground surface. House construction in this type of terrain usually requires extensive land clearing and the addition of fill soil to provide a level pad or acceptable base on which to construct footing and foundation walls. Moreover, because of the ground slope, houses are often constructed on crawl space foundations which bear on footings that stair-step “up and down” the natural and/or “artificially created” grade. Many times the footings are founded partly on rock and partly on soil. If the soil-supported footings settle and the rock supported footings do not, a differential settlement has occurred. Differential settlements are frequently the cause of foundation wall and brick veneer cracking; they are exemplified by stair-step crack patterns and/or crack patterns which indicate rotation or pivoting about a central point. Foundation settlements occur whenever the bearing pressure of the foundation footing exceeds the strength of the supporting soil. Settlements also occur if the supporting soils are fill soils that have not been properly compacted, or if the underlying soils include mixed organics (vegetation) that decay over time. It is not unusual for foundations to rest on large tree stumps or root systems that were cut to the ground level. Another common cause of foundation settlement or movement in our area is associated with underlying sub-grade soils. These soils are usually residual clays that have evolved from weathered limestone bedrock. Geo-technical engineers classify these soils as “highly plastic” since they behave “actively” over a wide range of moisture contents. Plastic soils physically shrink in volume when they dry or desiccate, and swell in volume when they become wet. Inevitably, during the summer months foundations tend to settle, causing cracks in foundations and brick veneer; during the winter months the cracks disappear. Proper site drainage is imperative in this geologic/topographic area because the soils should maintain a uniform moisture content. If water stands or collects in low lying areas near foundation walls, the sub-grade soils can become and/or remain saturated even as adjacent soils dry. Regardless of the cause, the potential for long term differential foundation settlement is very good in our area. Therefore, in new house construction, it is imperative that footings are located on stiff underlying sub-grade soils– preferably deep in the ground, below seasonal drying penetration–and that proper drainage is provided to prevent water from standing and soaking into the ground around the home (saturating the supporting sub-grade soils). Of equal concern is water that flows along the foundation walls; it can lead to erosion undermining.